I get asked often what I think of 3M Window Films and Probably 3M Prestige the most. I just show these pictures of warranty work I have recently completed! First and foremost let us not blame the faithful family friend and companion. 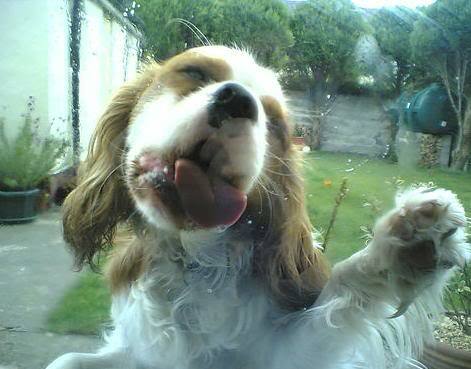 He didn’t make the film, he just licked the window! 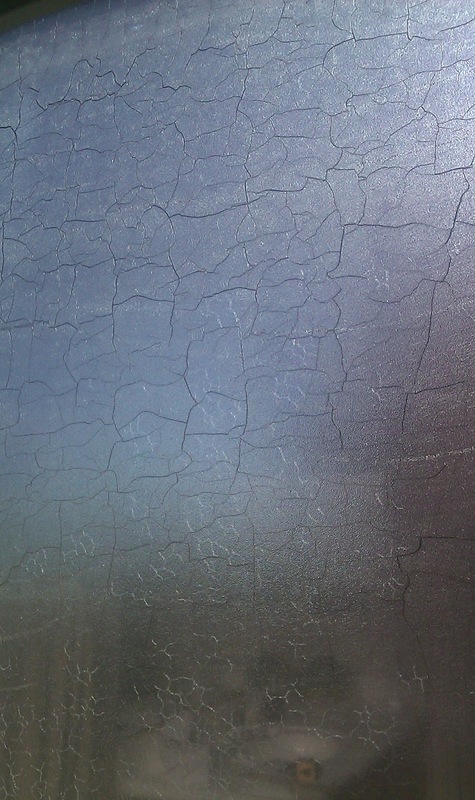 These are pictures of 3M Prestige 40 that the family dog Licked away the color coat which was stupidly put in the scratch Coat by 3M Window Film. A foolish Design flaw yet to be corrected! 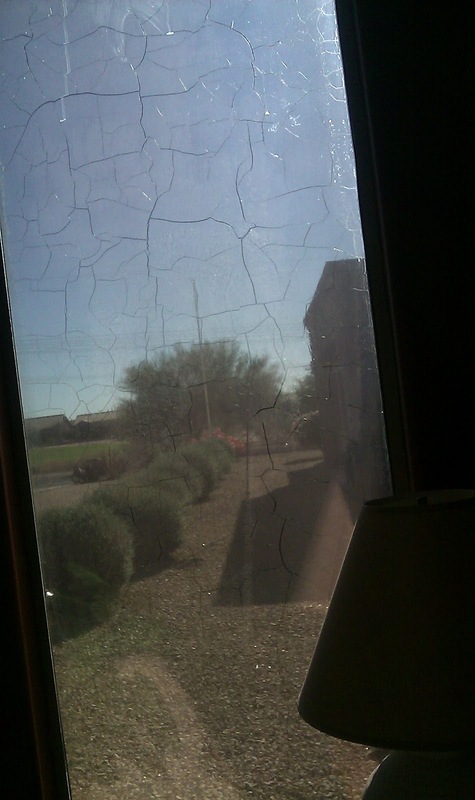 Made In The Shade installed thousands of Square Feet of this Lick a view film before we were aware of the design flaw! We have had several customers with pets (Cats and Dogs) giving a clearer view to their tinted window! We have had bathroom and kitchen windows washed clear of the color! 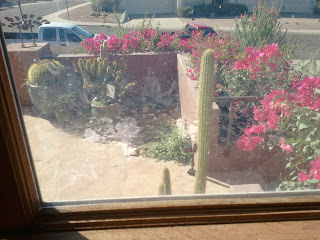 One Lady admittedly cleaned her windows excessively (Daily) and washed the color of most of the tint on the whole house! 3M Prestige has many serious flaws: The color coat as shown here in these pictures is the most ridiculous and obvious. This is the key to its high Infra Red absorption, when it is gone or faded you lose protection and performance; Other visual issues are Orange peel look, blurring and distortion in a few short years. 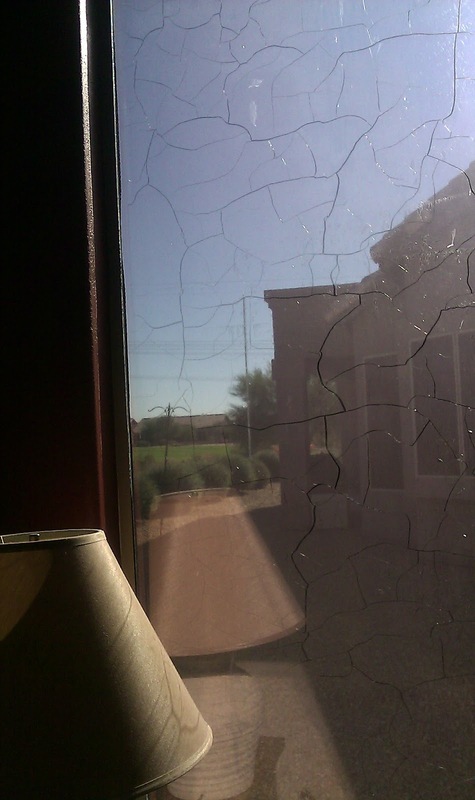 Lets talk about glass breakage too! 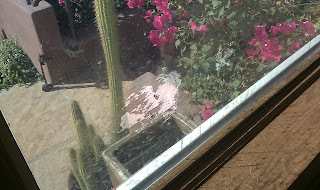 The film has little to no visual reflection…so where does all that heat from the absorbed Infra Red go? INTO YOUR GLASS AND FRAME! 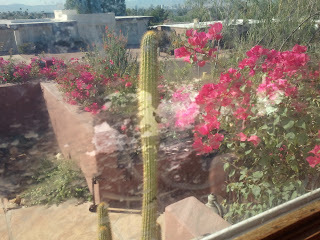 So guess what happens when to much heat builds up in your dual pane unit? IT CRACKS! When we were a Prestige dealer we installed a couple hundred thousand Square Foot of this Faulty Film. 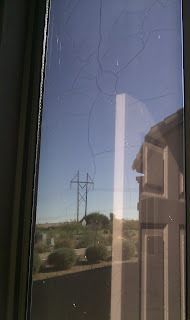 We came to realize that only the 70% Visible Light Transmission was okay for Dual Pane Glass, before 3M did! Lets talk heat reduction! As one of the first to be offered 3M Prestige I recieved the 1st Marketing literature, and it had all the usual specs all 3M Window Film did, including heat reduction. The numbers were as bad as a non metalized dyed film of the same shade! 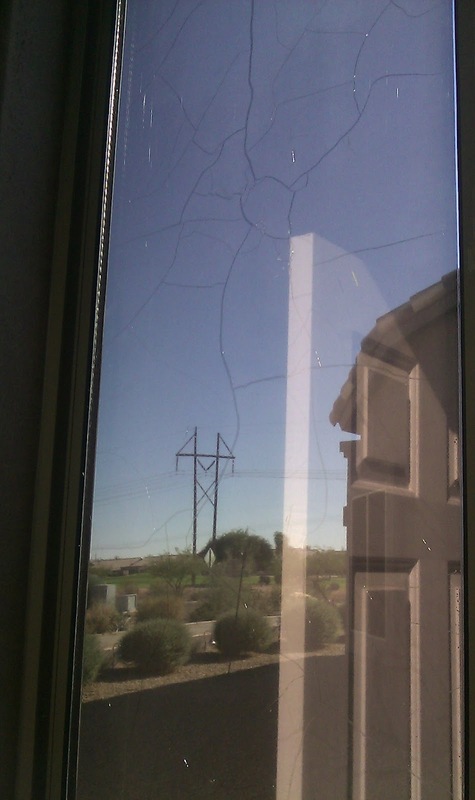 Prestige 40 on Dual Pane Glass was no better than a Standard 35 Neutral film AND it was discovered unsafe for Dual Pane Glass! New Marketing Literature was soon released and for the first time “Heat Reduction” was missing! They cleverly replaced it with a new never before used or acknowledged term “Total Solar Energy Rejection on Angle”! See our Blog The Prestige Truth! They also decided Infra Red needed to only be measured at 900 to 1000 Nano Meters, never mind the spectrum is from 750 to 2500! The truth is the best Spectral Select film that is safe for your Dual Pane is VKOOL! Alway has been and still is the King! The N.F.R.C. rates it he highest! All 5 Pictures are the same home owners windows! It is failed 3M Low E Copper! 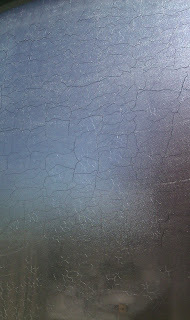 Notice the Cracking and distortion! 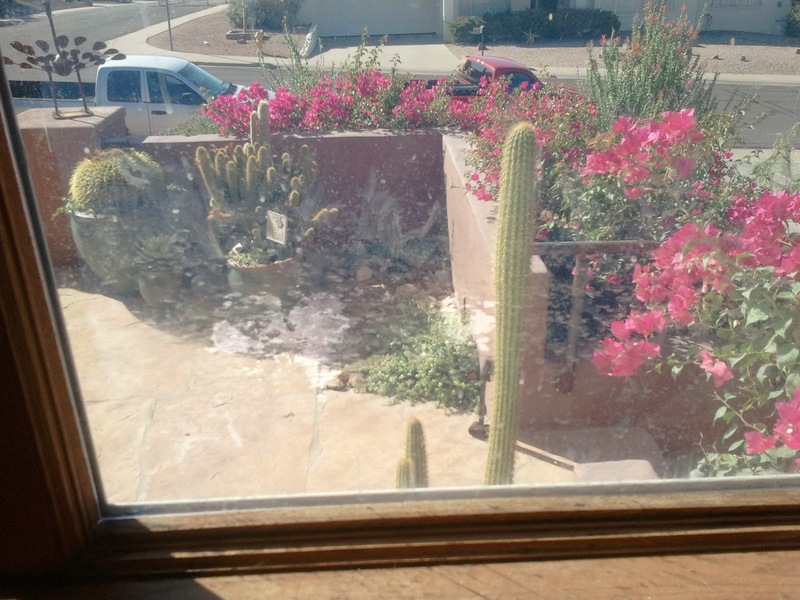 Not even the Dog will want to lick this ugly window! I tried to take pictures of many of these issues over the years but it hardly does the horrible 3M film justice as it does the building and vehicle owner injustice! I recently had to do my poor Mothers Windshield on her Honda civic. The Auto tint version of Prestige was Crystalline and it also created many re do issues for my customers. Her windshield was so blurry and distorted she could not see safely out of it any longer and the film had shrunk away from the edges and left unsightly light gaps! The 3M Color Stable gave us fading issues along with imprinting along the top of the door glass where it rolls up into the frame! I am no Longer a 3M Window Film Dealer for many reasons but Quality of the product and me being a squeaky wheel about it was the the beginning of the end as a dealer! The last 5 years as a dealer amounted to $100,000.00 of warranty claims. The last year as one of the largest dealers in the U.S.A. we had almost 10% of what we bought become warranty returns, which was almost 30 thousand Bucks! I’m not Bitter or Angry, I just know better now and feel it is important that the truth is told! We now make it our goal to only bring Quality durable products to our customers and not what we feel we have to buy due to a quota or threats from the manufacture. Update as of 6-17-2014; We are getting calls on average of 2 failed past 3M building window tinting jobs a month! This is astonishing considering the amount of foreclosures and vacancy’s! 3M is warrantying the issues although at a snail pace. We are now referring people directly to 3M as they delay getting us the replacement film or returning our calls. This failure rate is approximately 5 times higher than the other manufactures we have installed and 2 to 3 times sooner! We quit installing all 3M Window Tinting in 2008, we hope the end is near! Rest assured with the films we sell, Puppy and kitty can lick away…or better said it won’t lick away!